This guide covers features that are only found in the Windows and Mac versions of Synthesia. In this guide you'll learn a few ways to play other songs in Synthesia: those you created yourself or found elsewhere. Several methods are covered. First, it's important to understand which types of music Synthesia can use: MIDI files. A MIDI file contains a list of instructions that describe which notes to play using which instruments at which times. This is different than a WAV or MP3 file which only contain a squashed-down signal ready to send out to speakers. So, be sure you've got a MIDI version of the song you'd like to play. Most sheet music software can export MIDI files. Often, the fastest way to jump right into a song is to use the Synthesia shortcuts built right into your operating system. 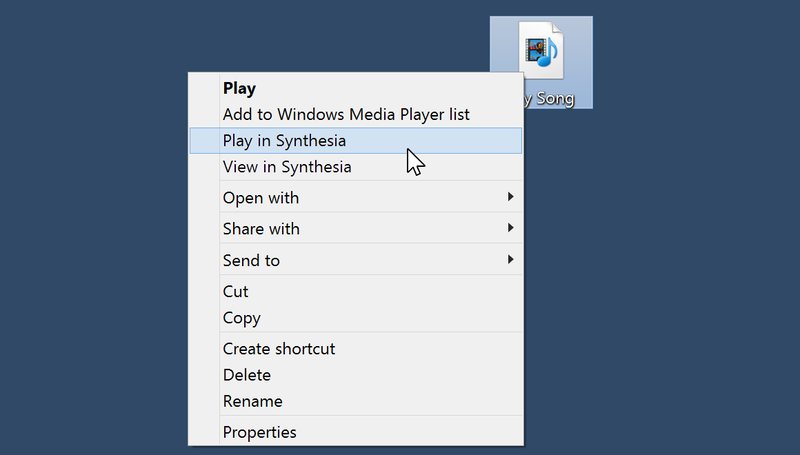 On Windows: Right-click the song and choose "Play in Synthesia". On a Mac: Right-click the song, hover "Open With", and select "Synthesia". To make a song appear in the list inside Synthesia, it takes a few more steps. In the long term, the time spent setting this up is worth the extra convenience of having all your songs shown inside Synthesia. Start by deciding where you'd like to store your MIDI songs on your computer. 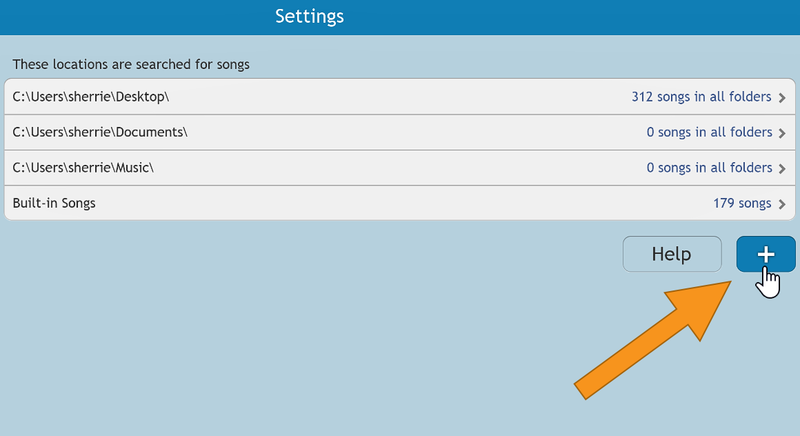 This can be in your user account's premade Music folder or some new folder you create yourself. 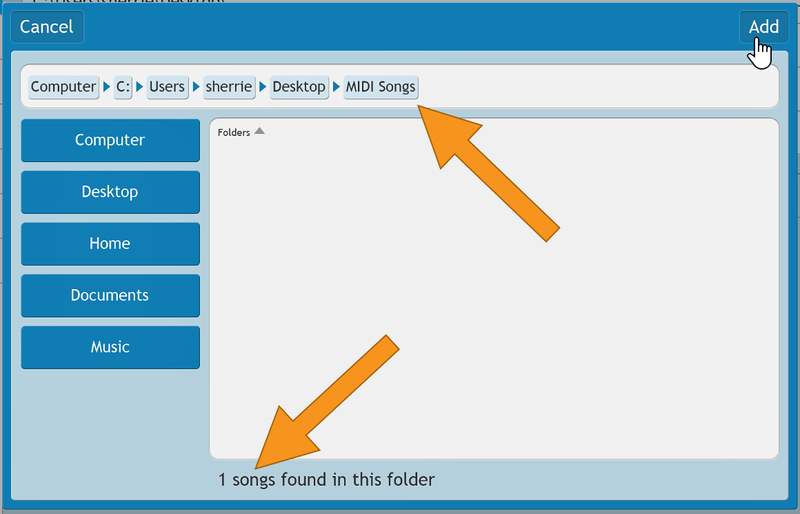 For this example, we'll create a "MIDI Songs" folder on the desktop. Copy or move your MIDI files into this folder. Start Synthesia and select Settings from the title screen. Choose the Songs tab from the list at the left. Locate and click the large + button below the list of searched folders. In the window that appears, use the large Desktop, Home, Documents, etc. shortcuts to help navigate to the folder that contains your songs. Single click entries in the folder list to navigate. 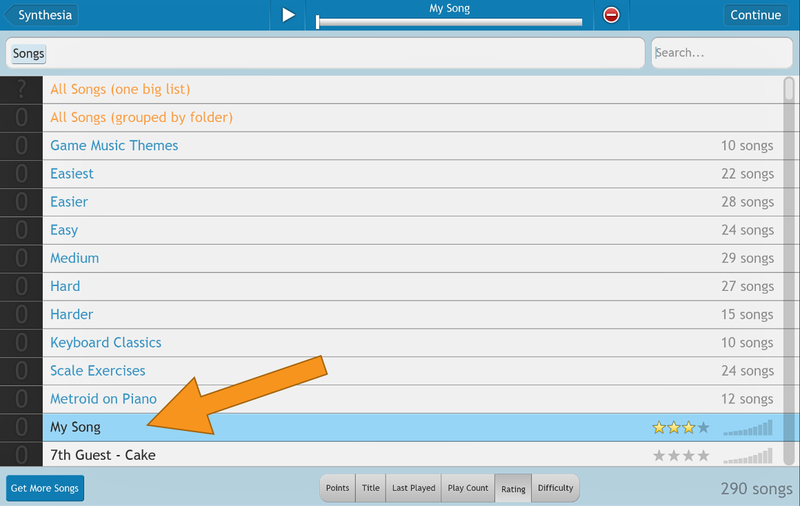 Once you find and navigate inside your desired folder, it should show the number of songs found at the bottom of the window. Click the Add button in the top-right corner. That's it! From now on, when you start Synthesia, it will search your folder for your custom songs.